Your baby already weighs between 85-142g and measures up to 13cm in length. The eyes should be in the right position by now and despite the fact that the eyelids are still sealed, they are already able to distinguish light from dark. While you are unlikely to be feeling any movements yet, your baby is able to respond to touch and will probably wriggle away when your tummy is poked. 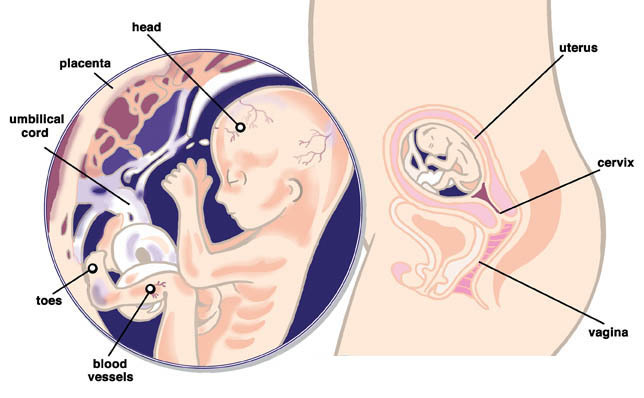 Your baby can also hear sounds from outside your tummy now and probably reacts to sudden or loud noises. The umbilical cord is continuing to grow thicker and is getting stronger all the time; it continues to be the lifeline for your baby, bringing them nutrients and removing their waste. Now that your baby has some coordination in their hands they may well be playing with the umbilical cord, wrapping their little fingers around it and moving it around! As you continue to put on weight you may find that you experience pains in your lower tummy. These may feel like stretching or cramping pains and are most likely just the feeling of the uterus growing and stretching the wall of your abdomen. If these pains last for long periods of time it is worth contacting your GP to ensure that all is well. While your hormones could have you sitting on top of the world right now, you may also be finding that you feel more anxious as the reality of parenthood sets in. This is perfectly normal and you will find that nearly all women feel this way at some point during their pregnancy. Go easy on yourself and make sure that you talk these worries through with your partner; you may find that they are feeling the same way. One of the most common worries during pregnancy is labour. What your experience will be and how you will manage the pain. This is one of the main focus points of antenatal classes and now is the time to look into them. There are private options available which you will have to pay for, such as courses run by the NCT (National Childbirth Trust), but there will also be courses available either through your hospital or local surgery. Ask your midwife for more information on the NHS courses. Most people find that taking part in an antenatal course provides an invaluable insight into labour and your various options, such as pain relief or different labour positions. Usually, the course will also cover aspects of early childcare including how to safely hold, change and feed your newborn baby. On top of all this, one of the most commonly cited benefits of attending one of these courses is the network of other people that you meet who are in exactly the same position as you. Very often, long-lasting friendships are formed this way which can provide some very important support for you over the forthcoming months and/or years. Page generated in 1.3258 seconds.